Gpt choose us like official web reseller. This is a guarantee for. Gear indicator gpt pnp plug & play white color with support for yamaha yfm660 raptor atv 2002> 2005. 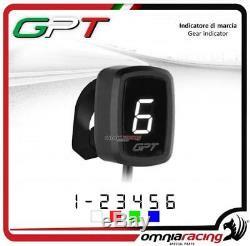 Code: al y w k. Gpt offers a range of motorbike counters in aluminum made from solid and interamante produced in italy. Designed and engineered for the bikes that, as standard, do not mount the gear indicator inserted on its dashboard and supersport bikes. The gear indicator made in italy. Whether it is a road ride or a lap, the gear indicator is useful for tackling any type of road with the right gear at the right turn. The gear indicators of the universal series operate on all motor vehicles equipped with a tachometer and electronic speed signal; require initial set-up before use. All the counters are powered at 12 volts, with solid digital, and are totally waterproof with front panel in anti-uv lexan. The plug'n'play series, on the other hand, works on all motorcycles with a diagnosis of socket and does not require interventions and connections on the electrical system, they are ready for use. While the gearboxes for kawasaki and the ducati scrambler are delivered already programmed. Anticorodal aluminum container made from solid. Anti-scratch and anti-UV lexan glass. Display available in 4 colors: white, red, green, blue. Dimensions 37 mm x 28 mm x 20 mm. In 1994, the passion and experience of manufacturing bertollini created omnia racing, with the aim of representing a reference point for everyone fond of bikes. In 2000, when salvatore orefice joins omnia racing, the company is founded, a society based on the passion and competence needed to create and trade the top products for motorbikes. Our continuous search for perfection and performance, using advanced technologies, has allowed us to interact with internationally recognized pilots and teams. Our products are excellent for both road and circuit use. They are continually tested by our technicians and pilots, thus improving the dynamics, dynamics and structural features of the materials adopted. The experience gained through the years of the competition has been greatly improved. Accostato, afam, aim, akrapovic, andreani, arrow, bazzaz, bc battery controller, bitubo, bmc, braking, brembo, bst, capit, castrol, derry moto, tuning fork, did, discacciati, eibach, ek, fabbri, far, frentubo , galfer, gbracing, giannelli, gifrap, givi, gopro hero, gpt, h2o, hagon, ixil, jollymoto, kappa, laser, lcr saddle, leovince, lightech, mafra, marchesini, marvic, marzocchi, matris, mivv, mra, nissin , ohlins, pbr, polini, pt, rizoma, rme, robby moto, sachs, stm, stomp, superb, suter, termignoni, valtermoto. Omnia racing is one of several important events: padova expo bike, national and international races, free circuit sessions. On the web, we are always associated with a direct contact with the customers, so we suggest the product that best suits their needs. This should allow our customers to feel at ease. All this has not been a decade ago, a reference point in italy; in addition, our products are still in demand in Europe and in the United States. The item "Speedometer gpt plug & play white + support yamaha yfm660 raptor atv 0205" is on sale since Tuesday, March 6, 2018. It is in the category "auto, motorcycle parts, accessories \ motorcycle \ spare parts \ instruments, gauges \ others ". The seller is "omnia-racing" and is located at 80055. This item can be delivered anywhere in the world.